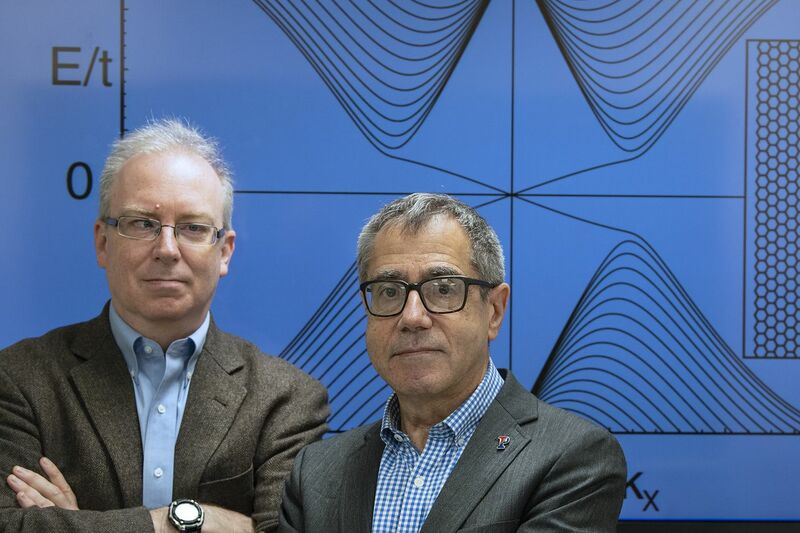 Penn physicists Charles Kane, left, and Eugene Mele won a $3 million Breakthrough Prize for their work on materials called topological insulators. Almost from the moment Charles Kane and Eugene Mele predicted the existence of an odd new type of electronic material — a wafer-thin hybrid of an insulator and a conductor — it was expected to play a role in future generations of ultra-fast computers. The practical applications of that 2005 discovery still lie in the future, but Kane and Mele were named the winners of a mammoth personal reward Wednesday. The two University of Pennsylvania physics professors are to receive the $3 million Breakthrough Prize in Fundamental Physics. The award, sponsored by an elite group of tech entrepreneurs, will be given at a Nov. 4 ceremony in Silicon Valley, along with six other $3 million prizes in life sciences, mathematics, and physics. Kane and Mele said they had no idea they were being considered for the honor. They learned of their good fortune in June via phone calls from past winner Edward Witten, a prominent physicist at the Institute for Advanced Study in Princeton, but were sworn to secrecy. "I was speechless," said Kane, 55. It is the seventh year for the high-profile prizes, sponsored this year by Google cofounder Sergey Brin; Facebook cofounder Mark Zuckerberg and his wife, physician-philanthropist Priscilla Chan; Tencent founder Ma Huateng; tech investor Yuri Milner and his wife, Julia; and 23andMe founder Anne Wojcicki. The type of material Kane and Mele envisioned is called a two-dimensional topological insulator. Using advanced mathematical tools from the realm of theoretical physics, they showed in their 2005 paper that such materials should exist. Not until 2007 did a team of German scientists actually create the materials, laboriously building them atom by atom from mercury, cadmium, and tellurium. Topological insulators sparked immediate interest in the world of physics and electronics because they act sort of like a divided highway, with an insulator on one side and a conductor on the other, forcing electrons to travel in an orderly fashion instead of with the usual chaos. "I tell my freshmen: 'Think of a crowded train station where people are bumping into each other. What these things do is like providing a conveyor belt on the edge,' " said Mele, 68. Kane, who sees Mele as his mentor, said this property could be harnessed to improve energy efficiency. "The hope is that we can take advantage of that for controlling how energy is dissipated in an electronic device," he said. After their initial paper, the pair went on to show in 2006 that in theory, a three-dimensional topological insulator also was possible. Sure enough, other scientists have since been able to create those materials, too — with an insulator on the inside and an electrical conductor on the surface. "It's like a Hershey's kiss," Kane said. "The wrapper is the surface conductor. The chocolate is the insulator." Mele said his interest in physics was kindled by one of his teachers at Cardinal O'Hara High School in Springfield, Delaware County. Another O'Hara teacher inspired him to pursue English, but when Mele went on to St. Joseph's University, he discovered his true aptitude lay in the sciences. He later earned a Ph.D. at Massachusetts Institute of Technology, and has been at Penn since 1981. Kane grew up in Iowa City, Iowa, fascinated by math from an early age — often lying awake in bed as he pondered equations. "I still do," Kane said. He earned an undergraduate degree in physics at the University of Chicago and, like Mele, received a Ph.D. from MIT. Neither has much of an idea how to deal with the financial windfall from the Breakthrough award, which they will split. "I'm not used to having this kind of problem," said Kane, who is married to Haverford College physics professor Suzanne Amador Kane. Mele said in the past, when he felt guilty about not tackling projects around the home, he promised his wife, retired human resources executive Hedy Cerwinka, that if he ever won a big prize, he would devote some of those resources to home improvement. "I was never expecting to have to make good on the promise," Mele said. "All those things are back on the table." The two physics professors first met in 1990, when Mele became aware of work that Kane was doing with high-temperature superconductivity at an IBM research lab. Mele invited Kane to speak at Penn, then was instrumental in bringing him back the next year for a permanent job. Other research advances recognized with the new crop of Breakthrough awards include: a treatment for a rare genetic disease called spinal muscular atrophy; research on the impact of having an abnormal number of chromosomes; the development of an advanced type of microscope called super-resolution imaging; the discovery of an enzyme that triggers autoimmune responses; advances in a branch of mathematics called the Langlands program; and research on stars called pulsars. This article has been corrected to reflect that Edward Witten is at the Institute for Advanced Study in Princeton, N.J.